Join Team Equissage at this year’s Melbourne International Horse Trials at their very own Equissage VIP Lounge! Opening the trade-stand to all, the Equissage VIP Lounge will be the spot to meet and greet your eventing idols, in between all the shopping and watching the three day event has to offer. With their impressive list of sponsored riders, including Megan Jones, Will Enzinger, Emily Anker and Amanda Ross, to name a few, Equissage will be bringing their riders direct to the lounge where visitors can engage in signings, photo opportunities and other activities relating to all things eventing and all things Equissage! As usual, you’ll get to see the exciting colour range and see how Equissage’s Cylcoid Vibration Therapy (CVT) operates with the many results to accompany! You can even bring your dog along too, as they’ll have their very own lounge throughout the event. Unfortunately, the stand is too small to allow horses to join in on the social fun, however there will be consultants on deck to provide your horse with a complimentary treatment demonstration if you’re competing. In addition to the Equissage VIP Lounge, the much anticipated draw of the Young Riders Squad raffle will take place the night of the cross country, where one lucky person will walk out as a new Equissage owner! Stay tuned to Equissage’s Facebook page to see who will be at the Equissage VIP Lounge at this year’s Melbourne international Horse Trials! 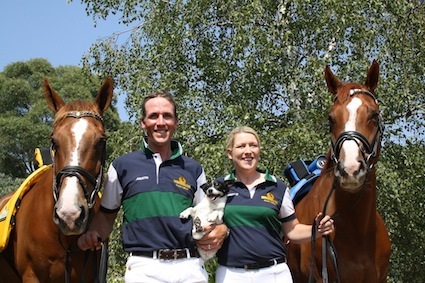 Equissage will be at the Melbourne International Horse Trials from 6 – 9 June 2014. Visit www.facebook.com/EquissageTherapy to find out when your idol will be visiting the Equissage VIP Lounge.